Nick Crowe (*1968 in Barnsley) lives and works in Berlin and Manchester. In many of his works, Crowe engages with our medialised invironment. He works as a sculptor and in new media. 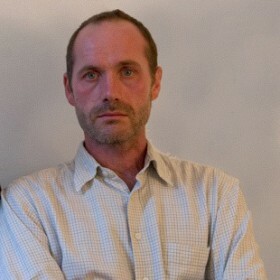 Together with Ian Rawlinson, he also has a communal practise in video and film. 2008: 'Sammlung Witkowska', Axel Lapp Projects; 2007: 'At 25 Metres', FACT Liverpool (with Ian Rawlinson). 2006: 'Nick Crowe', Cornerhouse Manchester. 2005: 'Operation Telic', con|temporary, Berlin; 2003: 'Getting On', Chisenhale Gallery, London; 'The Nineties', Mobile Home Gallery, London; 'Nick Crowe and Ian Rawlinson', Manchester Art Gallery, Manchester & Aspex Gallery, Portsmouth; 'Police Radio', FACT, Liverpool & New Media Centre, ICA, London. 2002: 'Explaining Urbanism to Wild Animals', Tmesis Gallery, Manchester (with Ian Rawlinson). 2001: 'Nasdaq Landscape', Yorkshire Sculpture Park, Wakefield; 'Kyoto Protocol', Flux Space, Flux Magazine Aug/Sept (with Ian Rawlinson), London. 2000: 'Nick Crowe' Mobile Home Gallery, London; 'SERVICE2000', multiple sites, World Wide Web; 'Discrete Packets', New Media Centre, ICA, London; 'Stuff with Glass and Light', Chapter Gallery, Cardiff; 'The New Medium', Lux Gallery, London. Nick Crowe & Ian Rawlinson are short-listed for the Northern Art Prize 2009. The exhibition of the 4 candidates will be on show from 27.11.2009 to 21.01.2010 at Leeds Art Gallery. The winner will be announced on 21.01.2010.